An email from the University of Hawai`i at Hilo’s Office of the Vice Chancellor for Administrative Affairs informed students the campus, all offices, and off-campus offices would be closed today Aug. 22 and tomorrow Aug. 23, 2018. All classes and events have also been cancelled for precautionary measures. 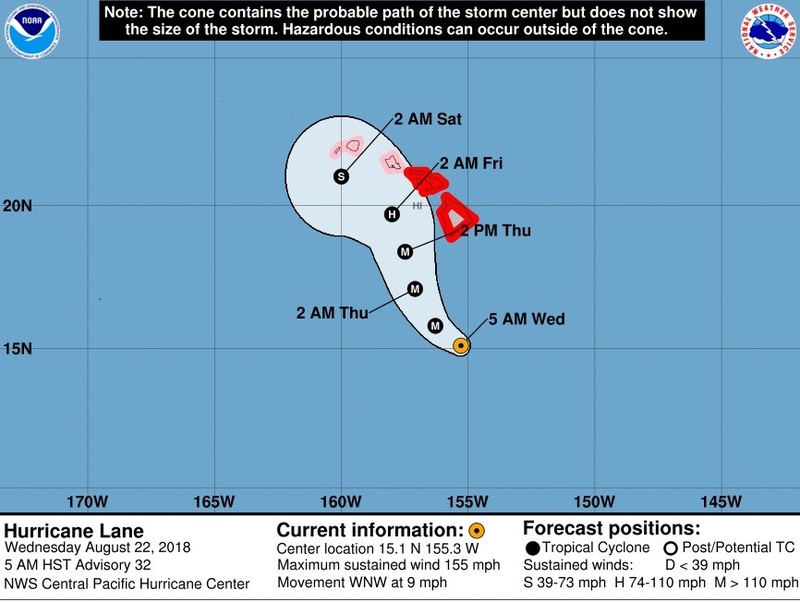 The National Weather Service issued a hurricane warning this morning at around 5:30 a.m. for multiple Big Island locations including Hilo, stating that the wind speeds could reach anywhere from 20-30 mph with some gusts reaching as high as 45 mph. The warning went on to list other potential hazards such as damage to roofing, uprooted trees, fences and roadway signs being blown over, debris in the road, power outages, storm surges, and flooding among others. Areas with the highest risk are places that are low-lying and near shores and rivers. According to the National Weather Service as the storm approaches ensure that you are careful walking and driving, close shutters and avoid sitting near windows, be sure to charge devices in case of power outages, restock your emergency preparedness kit, and create plans to communicate with family in the case of evacuation of emergency.